This page is written by the game's inventor, Hafsteinn Kjartansson. I made EVOCHESS (EVOlutionary CHESS) one night when I couldn't sleep. Pieces can promote not once but twice. (Some pieces may only promote once). It also has got the drop-rule from shogi. 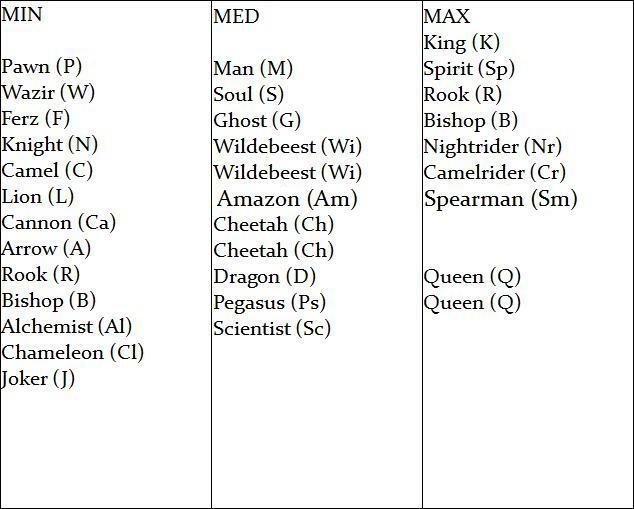 I made up some of the pieces but some of them are from the chessvariant pages' piecencyclopedia or from shogivariants. The PAWN is like the usual chess pawn except for: On it's intial move, it may move one, two or three squeres orthogonally without capturing. Each player starts with 12 pawns. 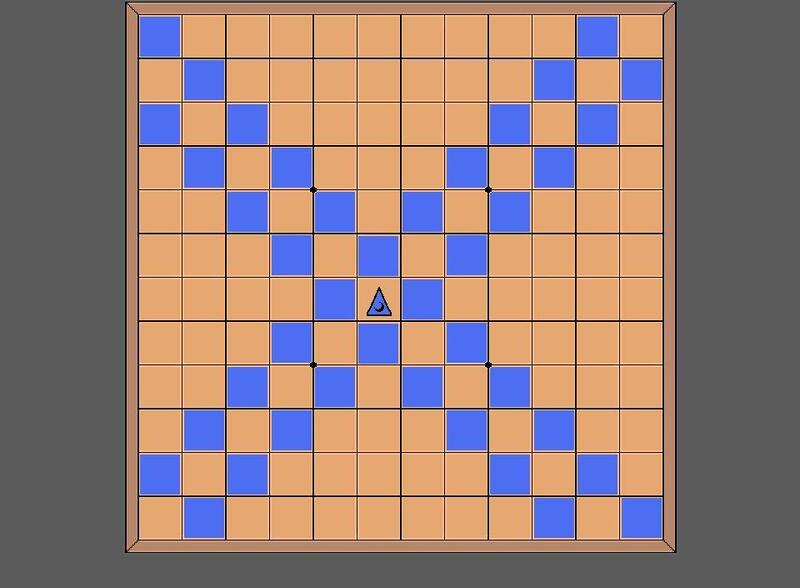 The WAZIR moves one square orthogonally. Each player starts with 2 wazirs. 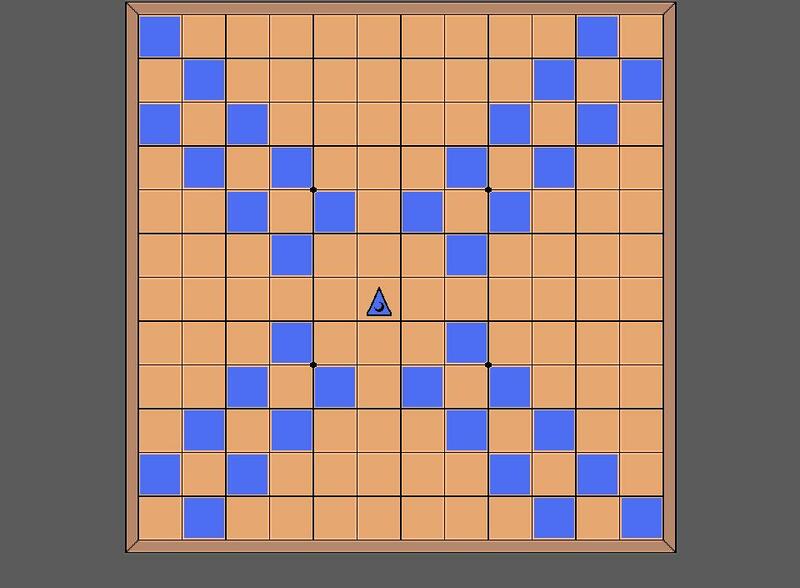 The FERZ moves one square diagonally. Each player has got two of them. The KNIGHT is the same as the FIDE knight. You've got two knights in the beginning of the game. The CAMEL is a (3,1) leaper. You start with 2 of them. The LION moves twice as king, it can capture on the first, the second or both steps, it may leap over pieces and it has the power of igui, that is moving to a squere and back again , capturing or not (capturing without moving and/or passing a turn). You start with one lion. See http://www.chessvariants.org/piececlopedia.dir/lion.html for details. The CANNON moves as a rook, but it can't capture that way. In order to capture, it must jump over a piece (friend or foe) and land on an opponent's piece, taking its squere. 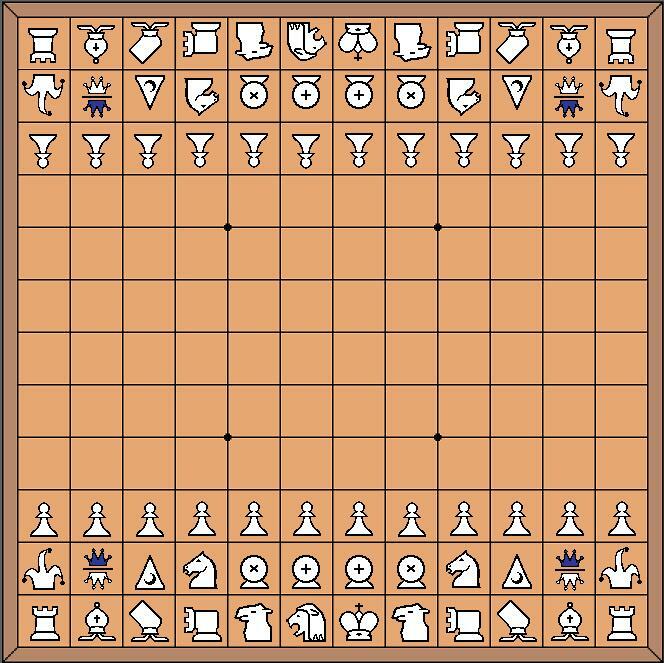 It's the same as in chinese chess (xiangqi). You start with two cannons. See http://www.chessvariants.org/piececlopedia.dir/pao.html for details. The ARROW or VAO moves as bishop but must jump as a cannon to capture (diagonally though). You've got two arrows in the beginning of the game. The ROOK is exactly the same as in usual chess. Each player has got two. The BISHOP is exactly the same as in usual chess. Each player starts with two. The ALCHEMIST is a bit complicated. You start out by moving as wazir, but you may not stop there. Next, you move as bishop IN THAT DIRECTION. See picture below. You start with two. The CHAMELEON moves as a queen but captures like the piece it is going to capture. See http://www.chessvariants.org/piececlopedia.dir/chameleon.html for details. You start out with two chameleons. The JOKER moves as the last piece your opponent moved. If your opponent moved a joker last turn, your joker moves as his joker moved. The MAN is a non-royal king. The pawn promotes to a man. The SOUL moves one square orthogonally (as a wazir) or jumps to the second square orthogonally. The wazir promotes to a soul. The GHOST moves as a ferz or jumps to the second square diagonally. The ferz promotes to a ghost. The WILDEBEEST moves as a camel or as a knight. The knight and the camel both promote to the wildebeest. The AMAZON moves as the FIDE queen or as the FIDE knight. The lion promotes to amazon. The CHEETAH moves as the cannon or as the arrow. The arrow and the cannon both promote to the cheetah. The DRAGON moves as a rook or as a man. The rook promotes to the dragon. The PEGASUS moves as a bishop or as a man. The bishop promotes to the pegasus. The SCIENTIST moves as a alchemist or as a wazir. See picture below. The alchemist promotes to a scientist. The KING, moves as a normal king. You start with one king. The SPIRIT moves as a soul or as a ghost. The man promotes to a spirit. The ROOK, see movement above. The soul promotes to a rook. The BISHOP, see movement above. The ghost promotes to the bishop. The NIGHTRIDER moves continuously as a knight. The wildebeest promotes to a nightrider or to a camelrider. The CAMELRIDER moves continuously as a camel. The wildebeest promotes to a nightrider or to a camelrider. The SPEARMAN moves as a amazon or as a lion. The amazon promotes to the spearman. The QUEEN, see movement above. The dragon and the pegasus promote to the queen. NOTE: ALL PIECES ARE THE SAME COLOUR. ONLY THEIR DIRECTION SHOWS WHICH PLAYER IT BELONGS TO. 3.En passant is as usual. 5.Drops are as follows: a. When a piece gets captured it turns back into a MIN-piece. The player who captured the piece, keeps it. b. Lateron, you may drop it back on the board. c. The pawn restrictions which are in shogi aren't in this game. Very interesting, but you probably again wrong with promotion sequence: on 12x12 board lion is stronger than queen. I'm not sure, is lion stronger or weaker than amazone on this board (on smaller board, it's most probably stronger). How about this: player starts with queen rather than lion, it promotes to lion, lion promotes to amazone (or, maybe, to compound of queen and lion, called budhist spirit in shogi variants. Probably, it's not necessary, amazone is probably actually stronger than lion and promotion to amazone is more interesting if it's stronger).